Shadow of the Tomb Raider was my first chance to write a real game review. I had a review copy provided by the publisher and a deadline to hit. I’m not a trained journalist (as I’m sure you can tell – be kind), rather I’m just a passionate fan who loved this game despite having fallen out with the series a while back. My experience of getting the review ready in time was awkward. So in love with the game was I that I spent a LOT of time exploring: finding and raiding crypts and tombs (finally!) in addition to completing some rather interesting side quests along with the main story. As with Reboot and Rise, I didn’t care much for the optional challenges (raise five flags etc. ), and so largely avoided them on my first run. There was so much valuable content that I realised I was running out of time simply by playing and enjoying the experience. I ended up breezing through the final third of the game, missing a fair bit of optional content, to ensure I’d seen enough to write a complete review. I’m full of sympathy for people who make their hobby their work. It can be very wearying and can turn something you love into a chore. Knowing you have to simply get through something that you would usually take your time with if you weren’t under contractual obligation must be tricky, especially when you have several titles on the go. Most critics have been positive with fair criticism of what is a very good, but not perfect, game. In particular I enjoyed Metro, Rock, Paper, Shotgun and IGN‘s takes as they very much reflected my own impressions of the game while highlighting flaws that I perhaps hadn’t considered. Search the #ShadowoftheTombRaider hashtag on Twitter and most fans are over the moon. I’m ecstatic to see the positive outpouring from longtime enthusiasts about Shadow, especially those like myself who have come back to the series long after abandoning it. However, there have been some popular publications whose reviews exhibit a curious lack of attention to detail as well as baffling nitpicking: Has the need to rush led to some unintentionally harsh reviews? Let’s look at a few sticking points that have been raised. Shadow is a challenging game, especially on higher difficulties where signposting of where to go and what to do as been removed. This is the kind of immersion fans of the classic series have been crying out for since 2006’s Tomb Raider: Legend. Eidos Montreal have been talking about the custom difficulty settings for MANY months now. 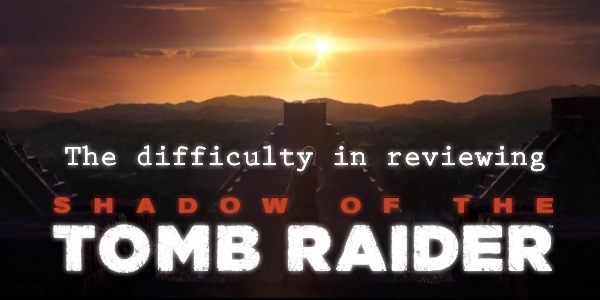 Imagine, then, the egg on one reviewer’s face when they dedicated an article to complaining about the hand-holding in Shadow of the Tomb Raider… which they played on the default difficulty setting while spamming the Survival Instincts function. I made the point in my own review that there are still a few too many hints regarding traversal on the toughest difficulty for my tastes (I’m hoping they will be patched soon), but the issues this writer described are easily solved thanks to the customisable difficulty settings that they clearly did not explore. There’s also the option to switch Survival Instincts off completely if you can’t trust yourself to not stab at R3, but don’t want to crank the difficulty up all the way. My first playthrough settings. I upped combat to ‘hard’ for my second playthrough. Another reviewer highlighted ‘instant death‘ in a Tomb Raider game as being a major issue that spoiled the experience for them… Yet this is a franchise famous for its spike pits and tripwire traps where instant death has always been a single misstep away. The shoals of piranha you must hide from in Shadow are avoidable by being cautious and patient; but patience, of course, is not always a luxury afforded to reviewers trying desperately to finish a game and get their article to print. Some of the more middling reviews offer complaints about small details, such as a merchant in a lost city selling wares from the outside world, or criticising the fact that the locals are so quick to trust you. However, these nitpicks go away when you actually pay attention to what you’re being told in the game, such as (a) this merchant is a renowned hunter who regularly leaves the city in secret and brings back interesting things (you even find her in both Kuwaq Yaku and San Juan afterwards if you explore), and (b) the locals trust you because you’re wearing a tunic showing the deposed Queen’s colours, indicating that she has vouched for you. Note that the locals in Paititi won’t talk to you if you swap out of that outfit. While I would like the option of wearing the default outfit in the city myself, this falls under being true to the immersion of the plot. The queen reassures a local – right in front of you – that you’re nothing to worry about. Gossip travels, you know! The plot “falls apart under the tiniest scrutiny” was a critique from a writer who apparently missed the above details in the narrative. I wonder if these same reviewers penned worse critiques of Rise’s plot and writing considering how predictable and derivative it was. I’ve seen the lack of combat criticised while other reviewers thought there was still too much. Eidos Montreal have made it plain that they wanted to improve the balance between combat, exploration, and puzzles so that there’s a broadly equal split between these three mechanics, instead of e.g. the ~60/40% combat/exploration that there was in Rise. Combat is very definitely not the focus when you weigh up all the optional puzzle and exploration content in addition to that in the main path, and the combat that is there has been tightened up significantly. There are also additional options available to Lara (e.g. stealth kills, avoidance), rather than merely run-and-gun. In short, combat is there if you want it but you can make it simply a puzzle to solve if you don’t. I’ve also seen some reviewers claim that Lara is far more whiny this time around; that she comes across as little more than a blundering killer. All I kept thinking is “where were you when Reboot and Rise were exhibiting all of these issues?” She’s stronger here than in either of the past two games, and it was great to not be shouting at the screen when the inexperienced (read ‘dim’) Lara missed an obvious important plot point… or five. Noticing a common thread running through the negative reviews of #shadowofthetombraider– none of the reviewers are actually fans of the franchise, and/or have an axe to grind. Tip: listen to the people who love the series. THEY'RE the ones who can best judge the game's quality. See, I love action, puzzle and fighting games. I love tennis, but hate pretty much all other sports. Putting me down to review a FIFA game, or even a classic like Goldeneye, would be disastrous because they’re just not my thing. Sometimes, listening to reviewers whose preferences don’t align with your own isn’t too helpful. Then there’s the problem with the traditional number-review scale, where games scoring in the 8–10 bracket are considered good–excellent, and everything below is considered naff – when in fact the perfect 10 really shouldn’t be attainable and everything above a 5 is actually good. A 6/10 score nowadays screams “average at best”, when most AAA titles automatically get higher scores. Just browse the message boards of some of these franchises/outlets and you’ll see that a lot of casual users scroll straight to the score and don’t read the nuanced explanation of why the reviewer thinks it’s appropriate. It doesn’t matter if the reviewer later clarifies on Twitter that they actually enjoyed the game: the damage has already been done. It's case by case, but with Shadow of the Tomb Raider the stuff I really liked were Challenge Tombs and exploring. Collectathons are annoying, but enough of a reason to see the gorgeous environments. Once all story/combat was over I was enjoying just chilling in the world. It’s interesting that the stuff Edmond liked about Shadow is the very same stuff we’ve all been raving about, but the things he disliked have been a problem since 2013’s Reboot. Yet Gamespot scored Rise of the Tomb Raider a near-perfect 9/10 back in 2015. I would have liked to read Edmond’s take on Rise, and see if he would have pointed out these issues at the time but alas the review was written by a different individual. Shadow of the Tomb Raider improves upon its predecessor in every way it could, within the constraints of this reboot trilogy. We have more exploration, puzzles and raiding (both on and off the main path). Side characters who are more fleshed out. Tighter combat mechanics with more options in how to approach a fight. It’s also a far prettier game with an absolutely belting soundtrack. It feels like a modern Tomb Raider game rather than Uncharted-lite. Does Shadow have problems? Sure! I’ll agree that the plot is a little hokey in places. Lara’s character remains a little dull at times. Polishing off another developer’s trilogy is bound to leave little wiggle-room after all. Issues regarding Lara interceding on behalf of other peoples and cultures without their consent are there too, and I can understand how some may have felt uncomfortable with a wealthy white woman plundering an ancient city of its gold and jade then selling it back to the inhabitants. Gameplay wise there is perhaps a little too much optional (and unnecessary) busywork and filler. But the thing that has me bent out of shape is this question: where were these critics when Rise of the Tomb Raider was exhibiting exactly the same flaws even more acutely three years ago? Where were they in balancing the 9/10, Game of the Year and Writing Achievement awards? When fans like us were criticising Rise‘s excessive hand-holding, weak plot, and lack of actual tomb raiding, why were the professional critics afraid to speak out? The issues in the series still linger because, up to now, the critics en-masse have – to my eyes – practically fawned over Crystal Dynamics‘ reboot series. After Eidos Montreal has gone to such lengths to listen and respond to criticism from long-standing fans about the way the game plays, why have reviewers now chosen this game to take a stand when Shadow actually gets so much right and fixes so many problems? Shadow has its rough spots, just like its predecessors, but it succeeds in having good, varied gameplay to fall-back on. I can only speculate whether expectations were lower at the time, or Microsoft‘s ‘exclusivity’ deal dollars had been put towards lobbying the gaming press and awarding bodies. We will never know. I don’t wish to come across as whiny as Reboot Lara, or to imply that people aren’t entitled to their own opinions. Despite some inaccuracies the reviews I’ve referenced all make genuine points. However, having been alienated from the series for nearly two decades, I’m genuinely upset that the same outlets who lapped up the lacklustre games of the last five years might prevent us from getting more of the good stuff Shadow gives us by being critical NOW, rather than a few years ago. This is especially pertinent because gaming companies still make a lot of decisions based on their games’ Metacritic scores. Heck, the number of people I’ve engaged with on Twitter who claimed to have cancelled their pre-orders, or felt that their hype had been ‘killed’ because of Shadow‘s average reviews, suggests the game likely won’t have the mass appeal of its bland predecessors which scored higher across the board – to our eternal bafflement. If that translates to disappointing sales figures then I dread to think what will become of the series. This is the kind of game we were hoping for (and unfortunately denied) when Survivor Reborn was founded after the reboot announcement. A far-cry from the previous two games which aped Uncharted at every turn, Shadow of the Tomb Raider by rights should save the franchise. This game feels like it has forged its own identity and is a true modernisation of the classic formula. With a few tweaks for next time, we could see the best Tomb Raider game ever – if Eidos Montreal stick to their guns, that is. So please, spare a thought for the experts who missed the mark on Shadow and deprived themselves of one of the best gaming experiences of this generation. Play it. Love it. Savour it – because sadly there’s a chance that thanks to those average reviews, we’ll see another generic shooter for the next title. Written by Matt Taylor. Edited by J. R. Milward. Tomb Raider Reborn: A Franchise Saved by Matt Taylor / Survivor Reborn is licensed under a Creative Commons Attribution-NonCommercial-NoDerivatives 4.0 International License. Classic TR series and tennis fanatic. Lazy artist, drinker of spirits and eater of cheesecake. I have enjoyed all the reboot Tomb Raider games thoroughly and will soon get Shadow and no doubt enjoy as well. Game reviewers live in some elitist club somewhere where nothing is new and exciting, all is familiar and contemptuous. I’m glad I don’t. I’ve never played Uncharted either. The series balancing of priorities brought me back to the games as I always avoided them in the 90s as they were too difficult and frustrating. Thanks for your comment, Jason! That’s the great thing about Shadow: it’s a game which recognises that its audience is filled with people with different gaming needs and preferences. I loved the challenge that the 90s games gave me and was able to get a similar experience by increasing the difficulty. You don’t have to play the same way though, and will be able to tailor the experience accordingly so that it isn’t frustrating. Best innovation of the reboot era in my opinion. What I noticed is that Eidos/Crystal listened to the fans and Shadow is the result of that. For example, the tombs are now integral to the game and you can’t avoid them, much like they were in earlier games. I always thought optional tombs/puzzles were a cop-out and I’m glad they saw reason on that point. The combat is more balanced now and it’s also more difficult, but then Lara does have some cool new moves too, like what she can do from above for example. I’m a little perplexed by her general demeanour though, when she’s not slaughtering the baddies. She seems awfully coy, which is in stark contrast to her attitude when she gets really fired up. I don’t quite get that. All in all, and only being about 10% through the game, I’m neither disappointed or gobsmacked; it’s pretty much what I expected, although from what I’ve read, it does get more surprisingly interesting later. Some important points I have noticed, at least on my new Ryzen/RX580 PC build, is the performance. The load times are significantly shorter, the graphics are stunningly beautiful, especially the mud and water, and the attention to detail is pin point sharp. Finally, I can’t help but wonder what Crystal have got up their sleeves for her next outing now that the reboot is complete and I have a feeling they want to turn the game on its head and surprise everyone.